The essential toolkit for tomorrow’s public sector. High performing public servants are adept at tackling complex policy challenges, from concept to delivery. This complexity means that an increasingly broad range of skills is required if you are to be effective in government. Policy in Practice will add new tools to your toolkit, sharpen your existing skills, and unleash your policy leadership potential. It is designed for people with some experience of policymaking to develop the capability to apply your skills in more complex policy environments. Nous Group and the Institute of Public Administration Australia WA (IPAA WA) will deliver a six day program that brings together a small group of public servants to engage with the latest techniques in policy design and delivery, and apply learnings to the contemporary policy challenges of government. The core program is designed to equip participants with the knowledge and skills to make a major contribution to policy development and policy implementation. Throughout the course participants have time to share their experiences and to hear the perspectives of external speakers through panel discussions. Throughout this program, participants work in groups to apply their learning to a contemporary policy problem. Groups will apply new and innovative approaches to policy design and delivery to the policy problem during the facilitated sessions and will also be required to spend some time outside of the sessions preparing their response to the policy problem. On the final day, participants practice their skills by presenting their response to before a panel of experienced Directors General and/or former Ministers, and receive feedback on areas for improvement. The program provides opportunities for participants to build or reenergise their networks across the public service. These networks create strong bonds across agencies that endure throughout their careers. The final day will conclude with a networking function for current participants and Policy in Practice alumni from previous years to help you build long-lasting networks and relationships. Policy in Practice is ideal for those looking to challenge themselves and learn more about how government tackles complex policy questions – not just in theory but in practice. It provides an automatic cross agency network and with it an opportunity to broaden your understanding of government in WA. The program has a strong practical focus that draws on emerging innovative approaches to policy design and delivery, which provides a unique opportunity to develop and apply new policy-making skills to the contemporary government and policymaking context. The opportunity to present to a panel of experienced Directors General and/or former Ministers provides a realistic and stressful but safe environment to test these skills. It has been developed to support the WA Public Sector Commission’s policy capability framework. 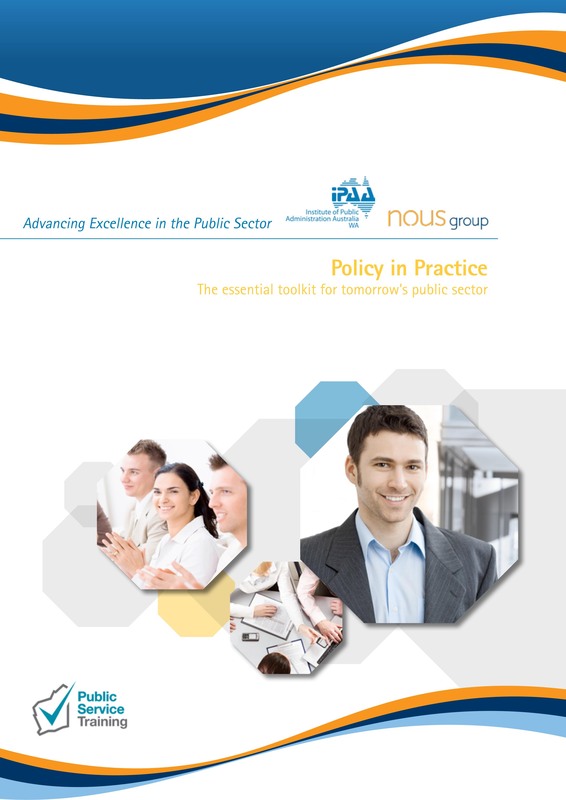 Policy in Practice will directly address many of the capabilities outlined in the framework. Build mastery, not just understanding: The program is designed to stretch participants and provide them with the tools to lead and deliver fundamental changes to policy in the increasingly complex and uncertain environments of contemporary government. They will be exposed to and apply emerging innovative approaches to policy design and delivery. Establish lasting networks: The program provides a platform to facilitate networking across agency silos and as such build long-lasting networks and relationships. Gain a greater understanding of WA government: Course content will be developed in conjunction with WA government agencies to ensure that the material and case studies are authentic and transferable to participants’ day to day work. ​Is this course right for me? Click here to take a 2 minute survey. Please note: Some of this content may have changed for 2019's program. The program is a six contact day program conducted over a three month period. One of these days (day 5) is a half-facilitator contact day, where attendees have a half day masterclass followed by time to do some group work. In between these contact days, attendees will be required to do some extra learning work, typically 1-2 days over the course of the program. Attendees are required to attend all days. The 2019 program will run from October - November 2019 (dates to be confirmed). The contact days for the program will run between 9.00am and 5.00pm on the days listed above.